Red hots, hot dogs, frankfurters, wieners, tube steaks, or weenies, whatever you call America’s favorite sausage, they are a staple of summer. July was National Hot Dog Month and I thought I would celebrate (a bit belatedly) with a post about man (or woman) biting dog. 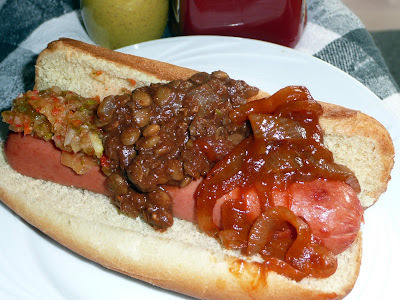 And topping said dog with homemade pickle relish, New York-style warm tomato onions and or a delicious (vegetarian) chili certainly improves the dog days of summer. The origins of the first actual hot dog in a bun as we know it are murky, but America’s claim goes back to 1870 in Coney Island, a beach resort in Brooklyn, N.Y, which by 1916 leads to the creation of Nathan’s Famous hot dog stand by Polish Jewish immigrants and its popularity with the throngs of visitors crowding the area’s beach and boardwalk. New York City is still the top dog in frankfurter eating, according to National Hot Dog and Sausage Council. As made by an army of street vendors through out the city, the New York all-beef dog is boiled or steamed and served in a plain bun with a tomato-onion sauce and mustard. However, a Coney Island hot dog is one served in a bun topped with chili. Chicago-style tube steak connoisseurs avoid ketchup, use a poppy seed bun and serve their all-beef dog with a pickle slice, relish, a pickled pepper, onions, tomatoes, mustard and celery salt. Here in the West, we are more likely to enjoy an alternative style hot dog, perhaps made from tofu, turkey or chicken than the rest of the country. I’ve adapted some of these favorite hot dog toppings. My Phoney Island Hot Dog Chili is vegetarian. New York Onions with Ketchup Sauce recreates the steamed onions with tomato sauce I loved as a child but with a more adult taste. Fresh Pickle Relish will perk up any hot dog but works well within the tradition of the Chicago dog. These recipes were featured in my jweekly column here, since they make the perfect topping for Kosher all beef or vegetarian dogs. Heat oil in large fry pan over medium high heat. Add onions, sauté until beginning to soften and light gold. Add pepper, paprika, cloves, sugar, salt, ketchup, tomato paste and water. Mix well. Bring to simmer, stirring frequently. Cover and lower heat and simmer, stirring occasionally, until onions are very soft and sauce has thickened, about one hour. Serve warm over hot dogs. Using a green bell pepper helps keep the relish it’s traditional green color. Red adds a bit of color. Finely chop or mince (do not puree) the pickles, onion, jalapeño (if using) and bell pepper and mix well. Add sugar, salt and vinegar. Mix. Cover and let stand for an hour. Taste and add more vinegar, salt and or sugar as needed. This recipe makes a flavorful and spicy “Greek” style lentil chili that works great on top of a vegetarian or regular hot dog (or as an entrée by itself). Try it with a sprinkling of raw onions and soy or regular cheese. This recipe makes a lot of chili. Try it for dinner on its own or as a spaghetti topping (substitute it for the beef chili in the Cincinnati Five-Way Chili recipe here, the seasonings are very similar) in addition to a hot dog topping. The chili improves if made ahead a day or two and can be frozen. Cook lentils according to package directions. Drain. Heat oil over medium high heat in a deep pot. Saute onions until golden, add garlic and sauté for a minute. Add broth, chocolate, chili powder, cinnamon, cloves, allspice, cardamom, cumin, and paprika. Bring to a boil. Add cooked lentils, bay leaf, tomato paste, diced tomatoes with liquid and vinegar. Simmer covered, stirring occasionally for an hour. Taste and add salt as desired. Simmer uncovered for 30-45 minutes until all the flavors have melded and the chili has thickened. Remove bay leaf before serving. About the photo: All three toppings on one dog. Not necessarily recommended for the faint of stomach, but useful for purposes of illustration.